As a strict vegetarian or vegan, you may be aware that some foods may contain ingredients that are actually animal in origin. Although some companies strive to assist vegetarians and vegans by labelling their food packaging, many still do not. There may also be times when you’re out at a restaurant, that having the knowledge of the commonplace use of certain animal ingredients in particular foods is helpful. This means that you can be sure that you’re not inadvertently eating a ‘hidden’ ingredient that you’ve otherwise eliminated from your diet. It may also help friends and relatives to plan suitable meals for vegetarian or vegan guests. 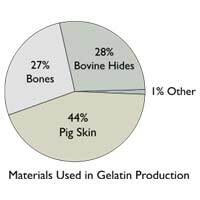 Gelatine (also spelt gelatin) is an animal-based gelling agent, procured from the collagen found in animal skin and bones, primarily pig and bovine. It can be bought in thin ‘leaves’, as a gelling agent in household cooking, but also regularly appears in a number of gum-like sweets and desserts, including cream cheeses and cheesecakes, mousse, yoghurt and even some ice creams. Isinglass has a similar role as gelatine, but is used as a fining agent in wine and beer production. Isinglass is actually thought to be one of the oldest sources of gelatine, as it is also a collagen, but it is obtained from dried swim bladders of fish. It was once used in confectionery and fruit jellies (such as blancmange), but has now been widely replaced by pig and bovine gelatine. Isinglass finings are widely used throughout the British brewing industry, particularly in the production of real ale (cask ales) and Guinness. Stearic acid is derived from the fat of cows, sheep and the stomachs of pigs. It has many derivatives, including Stearone, Stearoyl Lactylic Acid, Stearyl Acetate and Stearyl Citrate, although these are more commonly found in cosmetics and other personal care products, such as hairspray, soap and conditioners. Stearic acid can sometimes be found in vegetable fats and coconut fat in food. Carmine is a food colouring agent that also goes by the name of cochineal, or its derivative carminic acid. The red colour is obtained from the cochineal beetle, and is used to colour a whole host of foods and drinks, including coloured pasta, confectionery and fizzy drinks. Rennet (rennin) is the name for the enzymes procured from the stomach and tissue of mammalians, usually calves used in the veal industry. Rennet is used in cheese making as a coagulant to help separate the curds and whey in milk. As such rennet may not only be found in cheese, but other products containing cheese. These can include cheese-flavoured savoury snacks, pesto and cheese sauces. A vegetarian rennet is now available, derived from vegetable or microbial sources. Suet is an animal fat, usually taken from the around animal kidneys and loins. It is commonly used in baked goods, such as cakes and puddings, as well as forming a key ingredient in traditional recipes of English fruit mince (mincemeat) used in Christmas puddings. It is also a key ingredient in other steamed puddings, where the pastry is softer than traditional butter shortcrust pastry. Vegetarian suet is now available. Resembling shredded beef suet, it is made from fat (such as palm oil) and rice flour. Tallow is a fat that has been rendered from the membranous tissues of cattle and sheep, and is processed from suet. It is a solid fat that is not only used in some margarines, but may also appear in other waxy, fat products including crayons, candles and waxed paper. A derivative of animal tallow is oleic acid (also known as oleinic acid), which can be used in cheese, vegetable oils and vegetable fats, condiments, synthetic butter, ice cream, and even spice flavouring for baked food goods. This article provides a quick overview of just a small percentage of ‘hidden’ animal ingredients used in everyday food and drink. For a more comprehensive list of animal ingredients, contact The Vegan Society and The Vegetarian Society for more information.